Heat illness occurs when a person’s core body temperature rises above a safe level of the body’s internal temperature range. 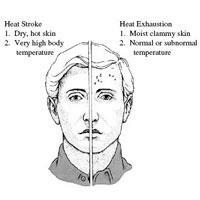 The most severe form of heat illness is a heatstroke, which may result in a shock, brain damage, or death. Have the person rest, legs slightly elevated, in a shaded area or cool air-conditioned building, room or car. Give the person an electrolyte drink or water. You can make a salted drink by adding 1 teaspoon of salt to one quart of water. Do not give beverages that contain caffeine or alcohol.